This Victorian brass stamping is richly detailed. It is plated in Matte Sterling Silver and then oxidized and antiqued to enhance all of the intricate details. This stamping is from very old tooling. 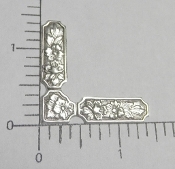 The piece is approximately 1-3/8".